Find bookmarks crafts, bookmark arts and craft ideas for kids and creative bookmarks here. Bookmarks make excellent crafts for kids. All those who are avid readers, would love to possess beautiful bookmark, because it is something essential that helps the readers to arrive at the exact point (of the story, novel etc), from where they left previously. Small though, bookmarks can serve as a very useful gifts for you teachers, classmates and friends, who are keen about collecting a wide variety of the item. 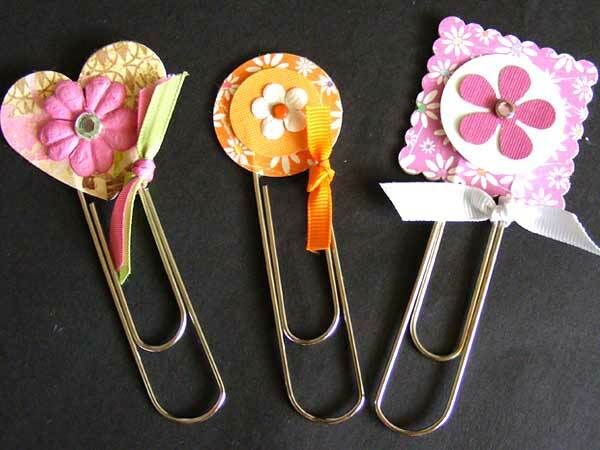 Since bookmarks are so easy to make and are small, you can make as many of them as you wish, in a short span of time. Bookmarks crafts can be used as a class project for kids and a leisure-time activity for adults. Apart from the usual cardboards and construction paper, you can make beautiful bookmarks out of a wide variety of materials, including beads and peacock fur. Moreover, the craft making activity is suitable for people of all age groups. By involving people of different age groups in the activity, you will be able to get a wide variety of bookmarks, because the intricacy and the level of creativity vary from one age group to another. Here we are to help you with some bright ideas for making beautiful bookmarks crafts, which will certainly be the cherished as nice gifts, party favors and keepsakes for a long time, just because of their attractiveness.